These questions were asked of Randy Alcorn by Creston Mapes for Storytellers’ Journal, Spring 2007. 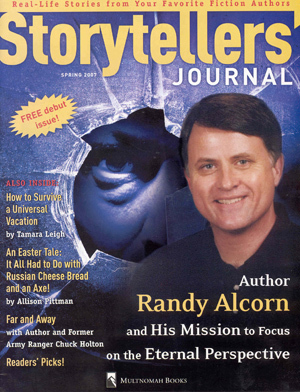 Unlike authors who, after landing their first contract, find themselves on a runaway treadmill trying to churn out one manuscript after another, often on topics about which they have no passion, Randy Alcorn has cleared a different path. Writing fiction is apparently one thing God wants him to do—fiction that sells. In 1994, Randy penned his first novel, Deadline, which he calls “an experiment.” He says, “I didn’t think I’d write another novel, so I threw a little of everything into that book: homosexuality, abortion, media bias. I was surprised at the strong response.” So strong, in fact, that Deadline remained a bestseller twenty-eight straight months and continues to sell well today. It had such an impact on actor Chuck Norris that he wants to make it into a motion picture. Randy’s new novel, Deception, the third book in his mega-popular 3D series, tells the story of homicide detective Ollie Chandler, who’s angry with God because of his wife’s death. In several scenes, Ollie’s wife is in heaven talking about her husband. While books 1 and 2 in the series—Deadline and Dominion—were written in the third-person omniscient style, Deception is penned in first person, from the perspective of the humorous yet hurting detective. In 1989, after years of serving on the board at a Crisis Pregnancy Center, Randy participated in nine passive, nonviolent acts of civil disobedience in front of abortion clinics to champion the rights of the unborn. His actions made Oregon judges livid and resulted in lawsuits that altered his life and ministry. “One of the abortion clinics attempted to garnish my wages from the church,” explains Randy. Randy’s mom took him to church as a boy one Sunday when they were giving away Bibles. It became the only Bible in the Alcorn home. Then, when he was a freshman in high school, Randy went to church one evening to see a girl he liked. He started attending youth group, heard the gospel message, and began reading the Scriptures. After eight months, he realized he believed what he was reading and prayed to invite God into his life. Years later he married Nanci, the same girl he went to church that night to see. Two daughters and four grandchildren later, Nanci remains his best friend. Although Randy was granted the gift of leading his mother to the Lord in 1970, his father remained resistant to the gospel. When his dad was eighty years old, Randy wrote to him, sharing Christ. The next time his father saw Randy, he seethed, “I don’t want you to ever bring that up again.” After a bout with prostate cancer, Randy’s father called to tell him he was going to take his own life. Randy persuaded him to wait until he got there, then drove his father to the hospital. His dad lay in a hospital bed, ready to go in for a major surgery that doctors warned he might not survive. “I said, ‘Dad, I know you don’t want to hear this, but I’m going to share it anyway,’” Randy recalls. “He couldn’t move, so he couldn’t get away. I read from Romans.” Randy explained to his father that all men are sinners, that the wages of sin is death, and that the gift of God is eternal life through belief in Jesus Christ. “I prayed for him to come to Christ, but didn’t really believe it would happen. He seemed an impossible case. After reading from Romans I said, ‘Dad, have you ever repented of your sins and placed your faith in Jesus?’ He said, ‘No, I never have.’” There was a long pause, as Randy thanked God, silently, for allowing him to share for perhaps the last time. Then his father’s words shattered the silence: “But I think it’s about time I did.” Right there, Randy’s father prayed and confessed his sin and gave his life to Christ just before being wheeled into surgery. His dad lived four more years, with Randy visiting him often for conversation, prayer, and Bible reading. 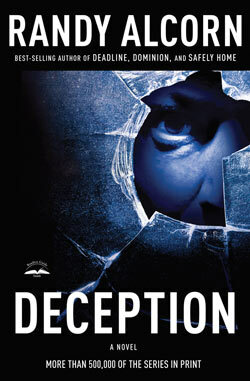 Randy describes Deception as a murder mystery in which a college professor has been killed and Detective Ollie Chandler is assigned to investigate. “As the case develops, Ollie begins suspecting certain people. The more he sees, the more his suspicions are confirmed that the murder was committed by someone he doesn’t want to believe did it.” Although there’s speculation that Deception will bring a close to the 3D series that has spanned thirteen years, Randy says he’s not sure. Ollie Chandler has become so real to him, he may not be able to let him go. Somehow, we get the impression that Randy will know what to do—when the time is right. This article first appeared in Storytellers’ Journal, Spring 2007. Creston Mapes is a suspense novelist and has been a professional writer for 25 years. I heard one author say, “Writing is like giving birth to barbed wire.” Others say writing is 5 percent inspiration and 95 percent perspiration.